Update 18 March 2011: This is where this series of posts finishes for the minute as I appear to have fried the MAX7219 (or something else is wrong with the setup) as I can send commands to it but the output does not make any sense. 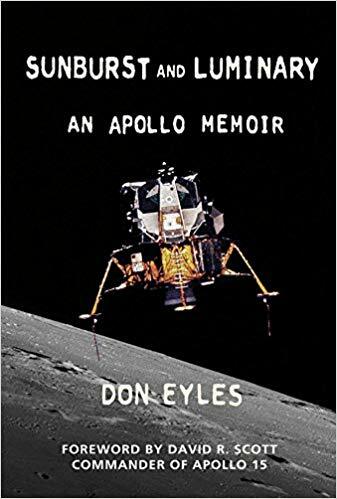 I’ll have to return to this series when I have a new chip. Similar to the first post but this time we will write a series of short integers using SPI. This will also start to implement the code which will write the data to the MAX7219 chip. 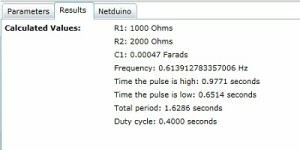 Hooking up a sensor to the Netduino and displaying the reading from the sensor. The objective of this post is to start to flesh out the code (which will be presented in the final post) to start to send commands in the form of 16 bit unsigned shorts to the MAX7219. All of the hardware remains as before and only the software changes. As before, the logic analyser is used to verify the results. The software required a minor update to convert the output to an array of ushorts and put the register in the msb and the data in the lsb. The main program does little more that send two commands to the logic analyser, namely a command to enter normal operation followed by a command to restrict the number of digits to four. This image shows the command to restrict the display to four digits being sent over the SPI bus. The next step is to complete the wiring and to start to send display data to the MAX7219. Similar to the first post but this time we will write a series of short integers using SPI. This will also start to implement the class which will write the data to the MAX7219 chip. Part of this exercise is to see if we can convert a 3.3V signal into a 5V signal. This is necessary as the MAX7219 uses 5V inputs. The quad input AND gate was chosen to do this for no other reason than I had a few spare in the component box. The data sheet for this chip states that the minimum voltage for a high input is 3.15V when the chip is supplied with 4.5V. A quick experiment shows that a 3.3V input signal to this chip does indeed result in a high output. 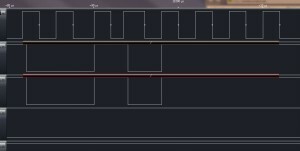 So by connecting one of the inputs to the AND gate to 5V and the second to the signal source, then the output from the gate should reflect the input but translated from 3.3V to 5V. One point to note is that the chip will take a little while for the signal on the inputs to be reflected on the output pins. This application will be running at a low frequency (10KHz) and so the chip should be able to keep up. The ground on the Netduino Plus should also be connected to the ground on the breadboard. Scrolling through the trace show each of the ASCII characters being interpreted correctly. So the next step it to start to build the class which will talk to the MAX7219. 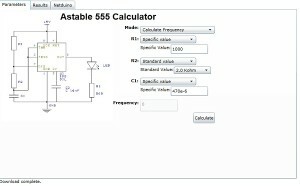 A while ago I wrote about my renewed relationship with the NE555 when I produced a simple astable circuit. The experience of trying to work out the values lead me to think about writing a calculator application. This lead me to wonder how I could validate the results given that I do not have an oscilloscope – simple add a data logger to the Netduino and use that. The following shows how I did it and provides some information about how the code works. This will require two applications, one to interact with the user and perform the calculations and data plotting and one application to capture the data on the Netduino. t Test the connection. This simply returns a Hello string to the calling application. g Get the preconfigured file and send this back to the caller. c SampleRate and FileName Configure the Netduino data logger. The system will configure the Netduino to log data every SampleRate milliseconds and store the results in the specified file. The last part of the change to the web server is to provide a mechanism to communicate the change to the data logging component. 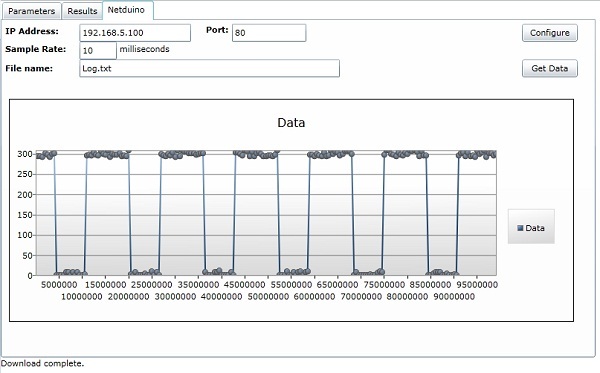 This done using an event as the data logger and the web server are executing in different threads. The next change required is to implement the data logging functionality. The data logging runs in the main thread. The on board switch was used to trigger data collection rather than having the Netduino log data permanently. The on board LED was also used to indicate if the board is collecting data. A Timer was used to trigger the collection of data from the analog pin. This meant that the board can capture at most 1000 samples per second. This code is tied to the on board switches interrupt. It starts and stops the logging depending upon the current state. A logging start request opens the specified file and puts the header into the file. This effectively deletes and results already stored in the file. The timer is created and tied to the CollectData callback. 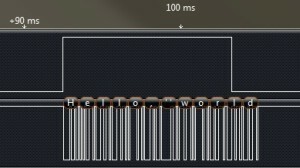 This callback simply reads the pin and writes the number of ticks since the start of the logging session along with the reading from the pin. This is where the project began to take on a life of it’s own. The code discussed here consumed the majority of the time spent on the project. The code is fairly well commented and so the main features will be discussed here. 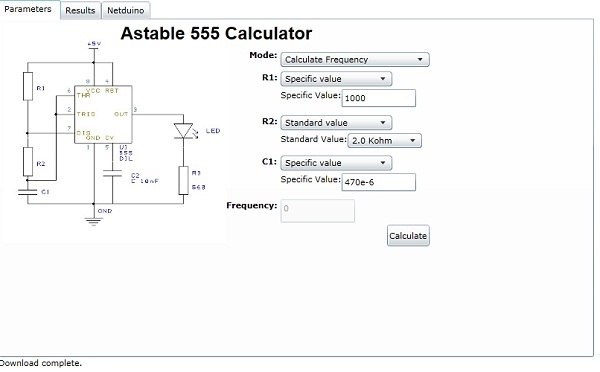 The project uses MVVM to implement a calculator for the NE555. This results in little code in the code behind for the main page. What code there is simply creates a new instance of the View Model class and calls methods in the class when buttons on the interface are clicked. The remaining communication is achieved using data binding in Silverlight. The system takes three of the specified values and calculates the remaining. The values for the components can come from three sources, a standard component, a user specified value or a range of values. If single component values are used (either standard components or user values) then a single result set is generated. If a range of values are selected for one or more of the components then the system will generate a table of values with one line for each of the requested values. So much for discussing the application, it is probably just as easy to try the application which can be found here. The first tab (Parameters on the application collects the parameters for the calculations and allows the user to request that the results are calculated. The next tab (Results) presents the results of the calculation. The final tab (Netduino) allows the application to communicate with a Netduino Plus. Although the Silverlight application is hosted on my web site, you can still use this to communicate with your Netduino Plus if it is connected to your network. Add data validation to the properties in the NE555Calculator class. 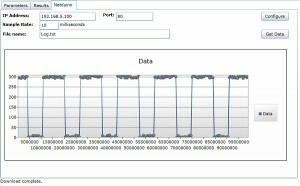 Make the data logger work with multiple files. Allow the configuration of the pin used to collect data. These are left as an exercise for the reader. As usual, these sources are provided as is and without warranty. They are used at your own risk. The Silverlight application can be run from a web site or from Visual Studio. The web server needs a little more than just running the project on the Netduino. You will also have to place the clientaccess.xml policy file on the SD card as Silverlight requests this file in order to determine if it allowed to talk to the web server. I’ve been considering getting one of these for a while and it finally arrived today. First impressions, well packed sturdy and smaller than I thought it would be. The software installed without a hitch. Powered up and connected to the Netduino to check it works. It took longer to write the test program than to install the software and hook up the analyser. 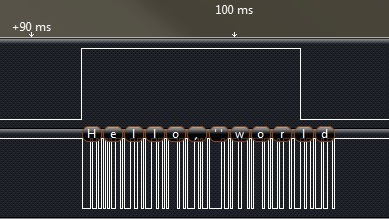 Well, the first program everyone writes has to say “Hello, world” – well it does if you are an old C programmer anyway.